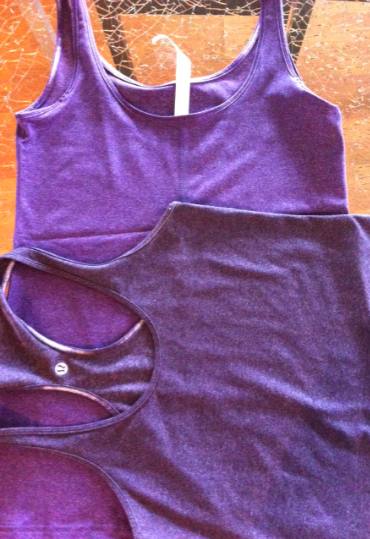 I just received my Daily Tanks and as per a readers request I’m posting a comparison of Heathered Concord Grape with Heathered Black Swan. Now the colors are pretty similar but if you are a purple lover then it’s worth having both in your closet, especially since the neckline and straps are different and Concord Grape is a more obvious purple. I am slightly disappointed that the Daily Tank wasn’t solid Concord Grape instead of heathered but I’m told by a little birdie there may be a solid Concord Grape CRB coming. The heathering is really hit or miss these days, some are super soft and others are a bit scratchy and weird feeling. My Black Swan CRB tends to feel a bit scratchy after a while and it’s not one that I would wear to sleep (occasionally I wear CRB’s to bed…not often though). Now my Blurred Blossom’s Daily Tank is gorgeous, gorgeous with a beautiful distribution of print that I’m quite happy with. More cherry blossom, darker purple green print than light pink peonies. My disappointment with that one is that unlike the Flow Y Bra which is only 44% polyester for some reason the Daily Tank in the same print is 97% polyester. What gives???? Now we know that luon can be printed with the same print in a higher quality fabric (lower polyester content) but for some reason they are choosing to make the CRB’s almost totally polyester. And those ones are not reversible as the tag says they are because one side is totally blank while the other is printed. I don’t find the high poly ones cooler to work out in, in fact I find they really trap heat. Please lulu, for the love of luon, please compromise and go with the 44% polyester blends instead of the 97%. The Flow Y bra felt so much nicer to the touch. 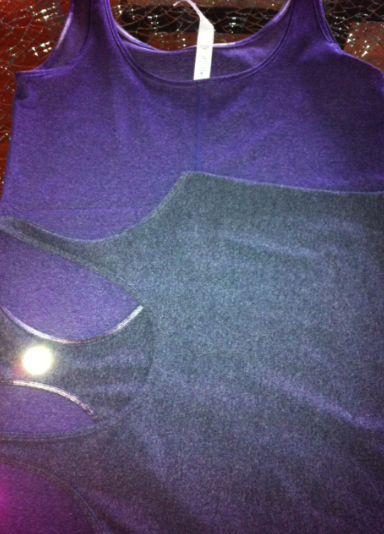 Heathered Concord Grape on the bottom (beneath) with Heathered Black Swan on top (above). "Photos Of The Latest: Dance Studio Jacket in Dune and Concord, Blurred Blossom and Concord Grape Daily Tank, Dance Studio Pants and Yoga Camp Crops."